While you are out and about, look for the letters A and B on signs in front of stores, on the covers of books, on signs inside stores, etc. Addison LOVES her magnetic letters because the letter reader sings the alphabet song, tells each letter name, and says the sound each letter makes through a song. Addison has really caught on to the letter names and sounds! When I am cooking, she enjoys playing with the letters and we talk about the letter names and their sounds. Focus on A and B. Cut out big, bold capital letters A and B from cereal boxes or magazines. Mix them up. Point to each letter and allow your toddler the opportunity to say whether you are pointing to A or B. Begin to sort the letters to make an A pile and a B pile. 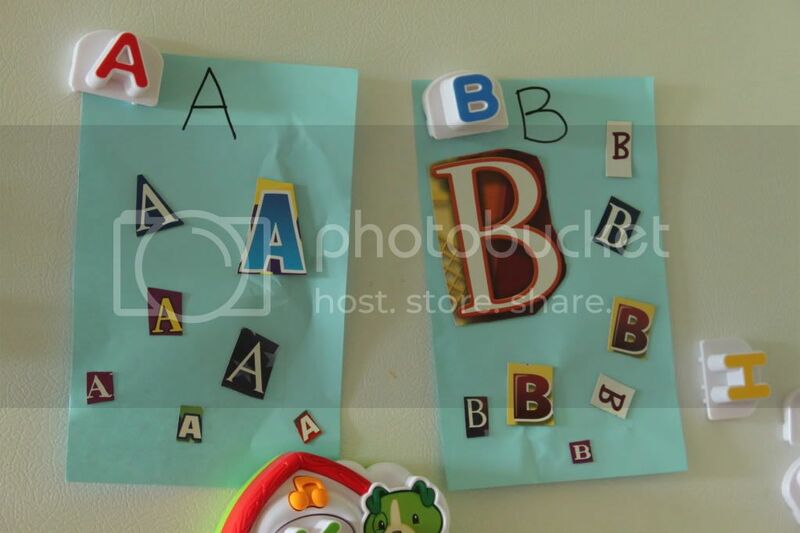 Teach your child how to use a glue stick and glue the letters onto a piece of construction paper labeled A and one labeled B. Place these posters in an area he or she can look at often. If your child is older, give him or her a magazine and go on an A or B hunt. Cut out the letters and allow your child to use a glue stick to glue them to a paper to make a collage. I would suggest doing all the As on one page and the Bs on another. Play “Mommy Says” with your toddler. Stand together and say, “Mommy says one jump.” Jump once with your toddler while saying “one”. “Mommy says two jumps.” Jump twice with your toddler while counting “one, two”. Continue this game with counting steps, clapping, etc. Since most toddlers are asleep at night, show your son or daughter books about the moon and stars. Take him or her outside and look up at the sky and explain that the moon and stars are up in the sky at night. During the daylight, look at the shadows the sun’s rays make while talking about the importance of the sun and that God made it for us. Birds - Go outside, sit on a blanket, and look up in the sky. Tell your child to wait for birds. When you both spot a bird, point to the bird and tell your child that God made that bird! See how many birds you can find. Notice and talk about what they are doing…are they flying, chirping, sitting in a tree? If your toddler will sit still long enough, begin to count the birds that you see flying by. Fish – We do not have a fish tank or a pond with fish nearby, so we will be heading to our local pet store to look at the fish. While there, we will marvel at the little creatures and I will tell Addison that God made the fish. 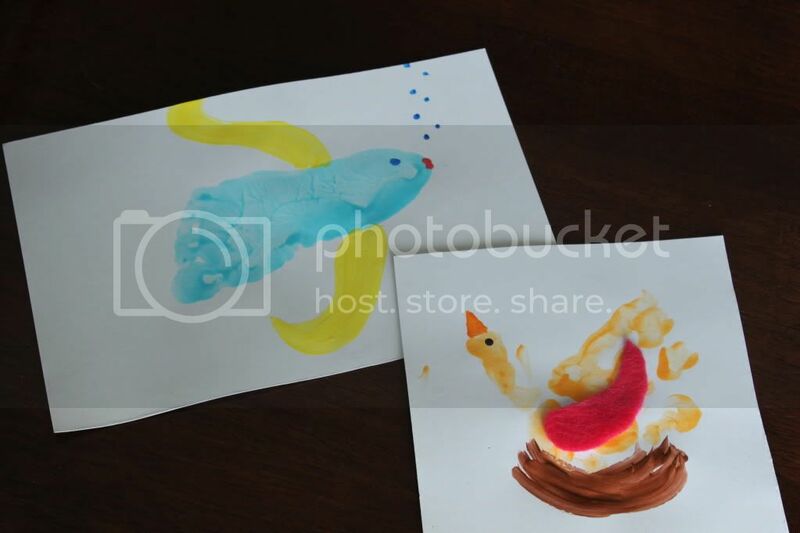 Note- you can also find the birds at the store and remind your child that God made birds too! Animals - While at the pet store (or better yet, the zoo! ), continue looking at the other creatures – hamsters, dogs, cats, etc. Tell your child that God made all the animals. Once you get home, look through an animal book. Look at each animal and say, “See the zebra? God made the zebra. See the goat? God made the goat..."
Man – God made your son or daughter perfectly in His image. They are flawlessly made. Point to each part of your child’s body and tell him or her that God made his/her nose, ear, eye, hair, hands, tummy, back, knee, leg, feet, toe, etc. This is a great activity to work on naming the body parts as well! Also, remind your child that God made Mommy, Daddy, brother, sister, grandma, grandpa, friend, etc. Reassure your child how much God loves them. Put a blanket and a pillow on the floor and pretend to take a nap with your toddler (in my house this will last for maybe two seconds!). Tell your toddler that God rested on the 7th day. Print day four coloring page from http://www.coloring.ws/creation.htm and allow your child to color as you remind him/her how God made the sun, moon, and stars. Get a half piece of black construction paper, mini star stickers, a yellow crayon, and a white crayon. Tell your child that God made the sun, the moon, and the stars. Allow your child to put the stickers on the page and you can draw the moon. On the opposite side of the page draw a yellow sun while talking about the fact that God made all of these. Remind your child that we see the moon and the stars at night and the sun during the day. Print day five coloring page from http://www.coloring.ws/creation.htm and allow your child to color as you remind him/her how God made the birds and fish. Print day six coloring page from http://www.coloring.ws/creation.htm and allow your child to color as you remind him/her how God made animals and man. Look through magazines and go on an animal hunt with your child. When an animal is found, cut it out and allow your child to glue it to a piece of paper. Continue to remind him/her that God made the animals. Go outside and trace the outline of your child’s body with chalk. If he or she isn’t comfortable or doesn’t understand what you are doing and is scared, have a friend or your husband trace you! Talk about how God made all people. Print day seven coloring page from http://www.coloring.ws/creation.htm and allow your child to color as you remind him/her how God rested. **Bind all 7 coloring pages together into a book. Re-read the story with your child on a regular basis. We LOVE the little book of mini prayers called "Thank You, God" by Kathleen Long Bostrom. We’ve been reading it to Addison each night before bed for a while now but I just realized the entire book is the story of creation!